EDMing THE WORLD'S SMALLEST HOLE? EDMING THE WORLD’S SMALLEST HOLE? MASON, OH – August 2006 – Many theories have surfaced on exactly who has machined the world’s smallest hole. The topic has been debated around the globe. But Makino has done it in Japan on a communications /fiber optic part – a stunning 0.00044 inch finished hole diameter, and was cut on the Makino EDGE2 Sinker EDM machine with fine-hole option using a 0.00024 inch diameter silver tungsten electrode. Other specifications of this achievement include a hole diameter held to ±0.00005 inches with positioning pitch location accuracy of ±0.0005 inches. Positioning pitch between holes was 0.004 inches. Work piece thickness at hole location was 0.0010 inches. The EDGE2 Sinker EDM machine with fine-hole option provides consistent hole size and location to within .002mm repeatability. Automatic Electrode Dressing Technology creates ultra precision electrode diameters as small as 0.0002 inches. 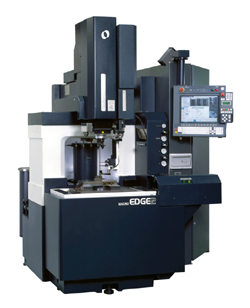 Key technology on the EDGE2 Sinker EDM machine with fine-hole option includes high accuracy, high-speed spindle and precision positioning accuracy. The ultra precision discharge circuit for micro machining also contributed. Small Hole Capabilities at Makino U.S.
Makino’s EDM Applications Department in Auburn Hills, Michigan, has produced holes as small as 0.0015 inch diameter in testing. As a demonstration to potential customers of the EDGE2 Fine Hole EDM, they have produced a Makino demonstration piece with 1,334 holes of 0.0041 inch diameter. It was cut into the CD650 carbide piece using a 0.0039 inch diameter copper pipe electrode. Hole diameter tolerances held were ±0.0002 inches, with a positioning pitch between holes of 0.0080 inches. Positioning pitch location accuracy was ±0.00008 inches and the work piece thickness at hole location was 0.015 inches. Machining time per hole was 18 seconds, and total machining time was 6 hours, 40 minutes using four electrodes. The Makino EDGE2 Sinker EDM machine with fine-hole option provides consistent hole size and location to within 0.002mm repeatability. Automated Electrode Changing and electrode handling mechanism ensure maximum unattended operation. The Makino EDGE 2 Sinker EDM machine with fine-hole option achieves maximum micromachining performance with superior surface finishes. “It is not just a fine-hole machine. It’s a standard Ram EDM machine with fine-hole capability. It can be used as a sinker machine and a fine-hole drilling machine,” says Kiszonas. Kiszonas adds that Makino’s EDGE2 Sinker EDM machine with fine-hole option is ideally suited for the medical, electronics and aerospace markets, as a result of the trends toward smaller and lighter parts with high functionality in these areas. Kiszonas says that Makino’s EDGE2 Sinker EDM machine with fine-hole option has tighter tolerances and a better finish than a laser machine. He adds that 60-70 percent of fine-hole technology work is being seen on parts these days, with the remainder being seen in tooling. With that kind of demand, the Makino EDGE2 Sinker EDM with fine-hole option is ready to meet those needs. Makino is a global provider of advanced machining technology and application support, where new thinking takes shape for the metalcutting and die/mold industries. Makino manufacturing and service centers are located in the United States, Japan, Germany, Singapore, Italy, France, Korea, Taiwan, Turkey, China, Mexico, Brazil and India, and are supported by a worldwide distributor network. For more information call 1.800.552.3288, or visit Makino on the Web at www.makino.com.